Computational Chemistry Highlights received nearly 21,000 pageviews in 2012. The most popular entries within the last 30 days can as always be found on the right hand side of this page. CCH currently has 122 subscribers on Google Reader, 80 twitter followers, 436 Google+ followers, 28 Facebook followers, and 27 followers on Linkedin. Two interesting questions are addressed in a focal-point computational study of t-butyl radical and thet-butyl anion from the Schaefer group.1 First, is the radical planar? EPR and PES studies from the 1970s indicate a pyramidal structure, with an inversion barrier of only 0.64 kcal mol-1. The CCSD(T)/cc-pCVTZ optimized structure of t-butyl radical shows it to be pyramidal with the out-of-plane angle formed by one methyl group and the other three carbons of 22.9°, much less than the 54.7° of a perfect tetrahedron. Focal point analysis give the inversion barrier 0.74 kcal mol-1, in outstanding agreement with experiment. Second, what is the electron affinity (EA) of the t-butyl radical? Schleyer raised the concern that the alkyl anions may be unbound, and suggested that the electron affinity of t-butyl radical was -9.6 kcal mol-1; in other words, the anion is thermodynamically unstable. This focal-point study shows just how sensitive the EA is to computational method. The HF/CBS value of the EA is -39.59 kcal mol-1 (unbound anion), but the MP2/CBS value is +41.57 kcal mol-1 (bound anion!). The CCSD/aug-cc-pVQZ value is -8.92 while the CCSD(T)/aug-cc-pVQZ value is +4.79 kcal mol-1. The estimated EA at CCSDT(Q)/CBS is -1.88 kcal mol-1, and inclusion of correction terms (including ZPE and relativistic effect) gives a final estimate of the EA as -0.48 kcal mol-1, or a very weakly unbound t-butyl anion. It is somewhat disconcerting that such high-level computations are truly needed for some relatively simple questions about small molecules. (1) Sokolov, A. Y.; Mittal, S.; Simmonett, A. C.; Schaefer, H. F. "Characterization of the t-Butyl Radical and Its Elusive Anion," J. Chem. Theory Comput. 2012, 8, 4323-4329, DOI: 10.1021/ct300753d. What is the appropriate basis set to use for computing optical rotations? Hedgård, Jensen, and Kongsted examined the optical rotation of 1-6 using B3LYP and CAM-B3LYP at two different wavelengths.1 They examined a series of different basis sets, including the aug-pCS sets2 (developed for NMR computations), the aug-cc-pVXZ series and 6-311++G(3df,3pd). They compared the computed optical rotation with the different basis sets with the value obtained from an extrapolated basis set computation. The mean absolute deviation using either B3LYP or CAM-B3LYP at the two different basis sets are listed in Table 1. The bottom line is that aug-pcS-2 is the preferred method, but this basis set is rather large and computations of big molecules will be difficult. The aug-pcS-1 set is the best choice for large molecules. Errors with the extensive Pople basis set and the aug-cc-pVXZ sets are quite sizable and of concern (especially at the shorter wavelength). It should also be mentioned that even with the largest aug-pcS basis sets extrapolated to the CBS limit, the computed value of the optical rotation of 3 has the wrong sign! Clearly, basis set choice is not the only issue of concern. We remain in need of a robust methodology for computing optical activity. Table 1. Mean absolute deviation of the optical activities of 1-6 evaluated at two wavelengths. This paper presents absolute binding energies for 29 ligands complexed with cucurbituril (CB7) computed using PM6-DH+ and the COSMO solvation model. This is a great model system for studying binding: CB7 is a macrocyclic molecule made of seven fused-ring monomers and has only one conformational minimum. Many of the 29 ligands for which binding free energies have been measure experimentally are also conformationally restricted, and the binding free energies span a wide range: -5.3 to -21.5 kcal/mol. Because of this a fairly exhaustive conformational search was feasible and the number of conformations per complex ranged from 5 to 300 depending on the flexibility of the guest. The conformational search was done using the OPLS-2005 all-atom force field and a low-mode conformational search algorithm implemented in the Schrodinger software suite. 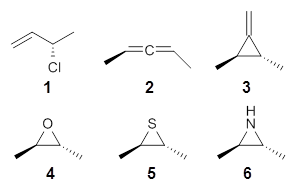 These structures where then used as a starting point for PM6-DH+/COSMO energy minimizations and subsequent vibrational analysis. Given the number of conformations and ligands this paper represents a significant investment of CPU time even at a semiempirical level of theory. The COSMO solvation energy is augmented by a non-polar solvation term that depends on the molecular surface area. Though not explicitly stated this must have been done as a single point correction. The computed binding energies correlate well ($R^2$=0.79) with the experimental results, but the root-mean-square error (RMSE) is high (11.4 kcal/mol) suggesting a systematic error. To address this a three parameter fit was made involving the COSMO and non-polar solvation energy plus an off-set, which led to a $R^2$=0.91 and RMSE of 1.9 kcal/mol, excluding one outlier. This analysis suggests that the COSMO solvation energies are overestimated by 4%, consistent with a similar analysis performed on 367 solvation energies for small neutral molecules. The off-set was found to be -5.83 kcal/mol, i.e. the predicted binding energies are systematically underestimated by nearly 6 kcal/mol. Interestingly, a recent analysis of explicit solvation thermodynamics of CB7, by Gilson and co-workers, "suggests that the water molecules in the CB7 cavity are unstable relative to bulk ... If so, then treating the water in the cavity as a bulk dielectric might lead to a significant overestimation of the host’s solvation free energy and hence the underestimations of binding affinities observed here." Furthermore, very recently Rogers et al. was able to compute an absolute binding energy for one of the ligands to CB7 using thermodynamic integration and explicit solvent that was in excellent agreement with experiment. The paper also provides a useful outline of how the thermodynamical aspects should be handled and analyzed, including a nice analysis of the conformational entropy change. For example, the translational entropy must be computed using a volume of 1 L rather than that of an ideal gas a 1 bar, and that one should compute the Helmholtz, rather than the Gibbs, free energy change since the change in volume of the solution upon binding is negligible in the condensed phase. There is also a reference to a real gem of a paper by Zhou and Gilson that reconciles the rigid rotor-harmonic oscillator approach to thermodynamics used here with that used in molecular dynamics studies. While the agreement with experiment is impressive there is some room for improvement and this system provides a great model system for testing all aspects of the binding energy including ab initio calculations of the interaction energy and new continuum solvation methods. The natural product aquatolide has the proposed structure 1.1 Before starting to investigate this rather unusual structure – the 2[ladderane] component is rare and likely to be a synthetic challenge – Shaw and Tantillo opted to reassure themselves that the structure is correct.2 They computed the chemical shifts of this structure at mPW1PW91/6-311+G(2d,p)//B3LYP/6-31+G(d,p) including PCM to model chloroform. Surprisingly, the mean absolute deviation of the computed 13C NMR shifts of 1 with the experimental values is 7.23 ppm, with the largest deviation of 24.3 ppm. The largest deviation between1 and the experimental 1H NMR shifts is 1.31 ppm. These large errors suggested that the structure is wrong. Surveying some 60 different possible alternative structures, largely based on other related compounds found in the same plant, they landed on 2. Here the mean absolute deviation of the computed 13C chemical shifts is only 1.37 ppm, with a maximum deviation of only 4.3 ppm. Similar dramatic improvement is also seen with the proton chemical shifts. Excellent agreement is also seen in the computed 1H-1H coupling constants between those computed for 2 and the experimental spectrum. Crystallization of aquatolide and subsequent determination of the structure using x-ray diffraction confirms that the actual structure of aquatolide is 2.